We are running a promotion for Wemax projector and our newly listed Xiaomi 4K projector. We have only very limited stock for Xiaomi 4K projector but we will have more after Easter. AU stock, 1 year AU warranty, GST included. Any questions or any new products you might be interested in please feel free to ask. currently using the 4k one, great even projected on the wall. Bought it in China for around 2k. Which 4k one is $2499, can you link? You're not talking about the wemax one right? I know thats advertised as 4k everywhere but all the spec says its 1080 so means its accepts 4k signal and downscales to 1080. The Xiaomi 4k projector is $3199 in this deal. oh yes that one is actually 1080. umm if the 4k one worth over 3k, i might import some and resell them! I think you might be referring the Xiaomi Global version which is only FHD resolution. We have that version for A$2349 normally. Is this a new model projector? Because their previous one was not native 4K. Your specs imply this one is, yet your description says "up to 150 inches of full HD quality images in 50 centimeters"
Yes, it is the native 4K one "Native Resolution: 4K (3840 x 2160)"
Sorry I would revise the description. Thanks for pointing it out. Looks to be a new one, the wemax is the old one thats advertised as 4k but specs are 1080. New one will most likely be one of those 4k one thats flicks 2 images to get the 4k res. Been out of the projector game for a while. How would this go with TV during the day? Likewise would be interested about how this runs during the day, if the technology is now that good to be able to watch with light I'd jump to purchase one in a flash. Hopefully OP can provide an insight. Depends on how the lighting condition & what surface it projects on. If your room is bright, IMHO it would not be comparable with a TV. 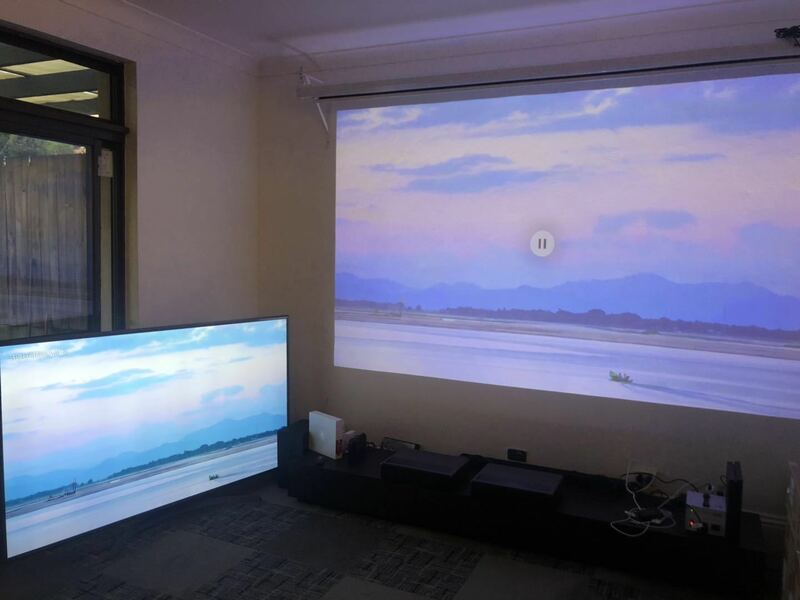 If your room is dark then laser projector is better as you can have the screen right to the edge of your wall. There is another thing call Fabulus Fresnel screen which works specifically for UST projectors. With that it would look very much like a TV. However, FF screen is a hard screen and its biggest size is 100 inches at the moment. And it is not cheap. Please note normal soft screen for rear projector would not work with UST projector. I took a photo with both the projector and my LG TV FYI. Been reading though various forums about this projector too. Some of the comments state that it shows everything at 60hz and there isn't a fix at this stage; not being able to correctly display 24p or 25p/50i/50p would be a dealbreaker for me. Would you be able to post the link here please? I am making a video review on it. Might be able to put that into the review. Ah, there's no one link but rather a whole bunch of comments spread across various forums. For instance, the first comment in the thread linked to above talks about stutter when viewing 50p UK TV on this projector. Looking forward to seeing your review! Anyone have input lag results on the Xiaomi 4K? Not that I can tell, but some might see slight rainbow effect as it is DLP projector. Can you mount the Xiaomi like a regular projector? as in not short throw? You can mount the Xiaomi projector upside down on the ceiling. However, it is UST so you need to mount it very closed the wall, unlike regular projectors. Hi there, I want to order the Xiaomi 4K but the code has been 'used too many times'. Is it possible to still order with the discount today or do I have to wait until after Easter? Really don't want to miss out on this offer! Sorry the Xiaomi 4K has sold out as we only have very limited stock this time. Will have more after Easter. Please leave message in the contact page with your contact. I will contact you after restock and run the promotional price for you. Yes, we have 1 year AU warranty. If anything goes wrong, simply send it back to our Sydney office and we will fix it for you. So dlp projector using Texas instruments dmd? Though there is no confirmation from Xiaomi, it seems the Xiaomi Global version is using Texas instruments dmd. Not sure about the 4K version though. Pretty much 100% of 4k dlp projectors use TI DMD. input lag being high isn't a deal killer, unless you plan on playing first person shooter games a lot.